The original sketches are being developed so as to evoke imagery of the American experience of September 11, 2001, through my personal filter as a New York jazz composer. The work begins with my depiction of the relative complacency of American life before that date, then takes the audience through the emotionally wrenching effects the events of that day had on the national psyche. It recalls that moment in time when, in silence and the stillness within, our personal and collective grief morphed into resolve and strength; when for a moment we all stood together, no matter our political or cultural differences. Through the use of a broad spectrum of harmonic colors and metric devices (beats per measure, feel, tempo, etc.) this five-movement symphony for jazz orchestra tells the story of the American experience from immediately prior to September 11, 2001 until today, from my vantage point as a New York jazz composer. It is one artist’s personal statement of sentiment as opposed to a political statement. As such it runs the gamut of emotions from contentedness, through horror, grief and ultimately strength in unity. The piece intends to invoke reflection on one’s personal experience with this national tragedy and inspire tolerance of each others’ opinions so that we might once again Stand as one people as we did immediately following September 11, 2001; E Pluribus Unum. Its first movement, The Homeland, opens by bringing the listener on a journey that begins with a reminder of our comfortable American life prior to September 11, 2001 in a definitively American swing, jazz style. The thematic material for this movement is derived from the inversion (upside down and tweaked) of the fifth movement’s theme. With the second movement, Tuesday Morning, we have a sense of the start of a perfectly beautiful, sunny day. As the day unfolds the melodic material, which I have been referring to as the Morning Melody goes through parallel transformations depicting the horrific and tragic events of that day, which, as I see it, never ended. The third movement, Benumbed, portrays the halting of our normally thriving and bustling culture, suddenly confused, grieving and bereft. It is the subsequent reaction; a moment of reflection, meditation and prayer, personally and collectively. A familiar cue offers the start of Valor, the fourth movement. What happens next is visually and aurally intended to provide a vehicle for transformation in the listener. While ironically utilizing silence, arguably the single-most dramatic effect in music, The United States Marine Corps Silent Drill Platoon enters* the staging area. This platoon of twenty-four infantry Marines, who are selected for ceremonial and security detail at Marine Barracks, Washington DC, based on their individual performance records as well as height and weight uniformity, perform an impressive, silent drill using M-1 Garand rifles with fixed bayonets, in ceremonial Marine Corps Dress Blue uniforms. In this context, their silencebecomes profound, offering the audience time to ponder the strength of those individuals who faced certain death, while in The Twin Towers or in one of four hijacked aircraft, and of our first-responders and elected officials. It offers time to reflect on having moved our national stupor toward strength through our collective will and wit, calling upon the ranks of our service personnel at local and national levels and realizing the magnitude of that collective strength. While silence is the most dramatic effect in music it is also a requisite to the element of surprise in military strategy; the apparent absence of activity, in this case sound, symbolically drawing The People and service personnel together through integrating American music and this spectacular ceremonial representation of our military in this unusual movement of performance art. The fifth and final movement for which the symphony is named, Stand, develops the musical theme originally sketched out on September 17, 2001. Taking its tempo from The Marines in movement four, it invites the audience to recall the momentary sense of unity we felt as a people immediately following these tragic events; an unusual moment in time when, as I see it, when all partisan bickering and self-absorbed behavior was suspended in order that we embrace each other, our wounds and our strength, and Stand as one, The People of The United States of America, E Pluribus Unum. 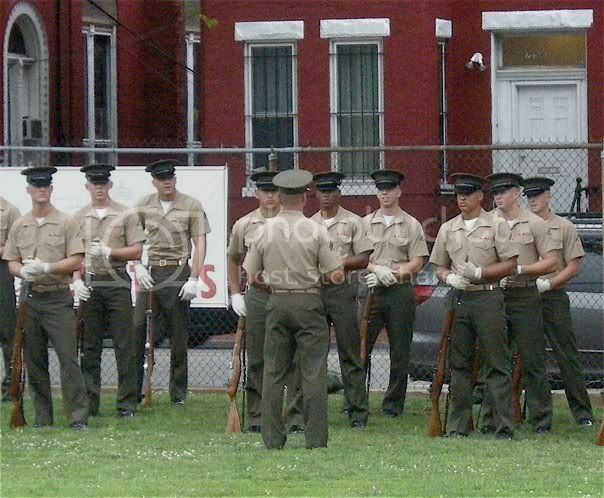 The Marine Corps Silent Drill Platoon Office of Operations has confirmed their support for the premiere production of Stand on September 10, 2011. You can contribute with your tax-deductible donation through the Contributors tab on this website. Your name will be added to the Contributors list and your donation will assist in mounting this project. As a New Yorker who frequented Greenwich Village and The World Trade Center, the events of 9/11/01 were of course personally devastating. My only solace was to write music. I began to create sketches on 9/12/01 and continued through December of that year. Soon I couldn’t tolerate the gut-wrenching effect of sitting with those sketches and allowed them to fall from my consciousness. In March 2010, I began revisiting my sketches, which were still as raw as the day they were forged. I wrestled with whether or not I could tolerate working with the material. 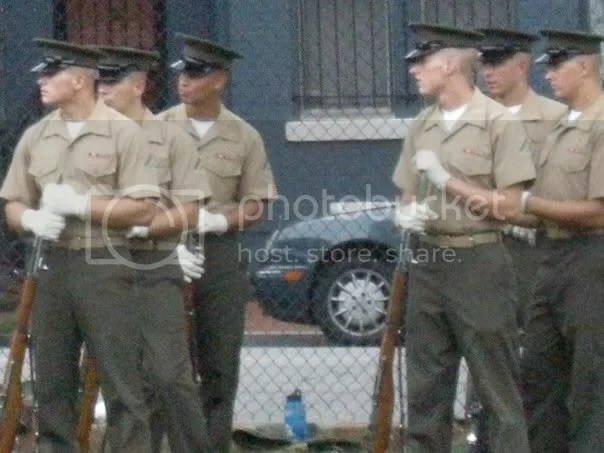 Through a series of personal encounters I happened upon the work of The United States Marine Corps, Silent Drill Platoon. Somehow the sublime statement of their silent performance seemed to define The Marines, their strength, precision and commitment; their role in The United States’ existence, survival and defense. This military ceremonial display of performance art by a meticulously trained platoon of high-security clearance infantry Marines, selected also for uniformity in height and weight, connected with my deep-seated guiding principle that silence is indeed the most dramatic effect in music. 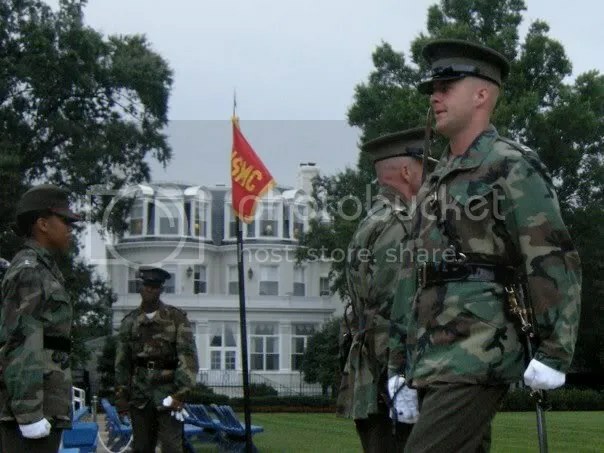 The moment I encountered the first video of The Silent Drill Platoon I was struck by a quiet, internal correlation between their marching tempo and the tempo of my strongest musical sketches, dated September 17, 2001. The material, which I had felt was very strong from its conception, had also been too emotionally wrenching to face in the intervening eight years. As I began to think about the approaching ten-year anniversary of this infamous day in our history, additional attempts at facing these sketches remained equally as challenging to face, until an elusive connection was made somehow, deep in the recesses of my subconscious as I watched The Silent Drill Platoon march to the tempo of those sketches. In a truly magical and inspired moment, while alone at my computer, I said out loud, “I NEED THAT! !” At that moment I felt as though there was something non-descript that I could derive from this drill team in order to both muster the strength within and convey a message of unity through the potential piece of music. With that, I became consumed with learning as much as I could about The Silent Drill Platoon, its origin, it’s purpose and who these chosen men are and how and why they are chosen for this duty. Once engaged in the idea that this ensemble might somehow be able to contribute to my ability to move forward in composition, I began to “follow my nose” with regard to research and imagining how my still ambiguous concept for a new work might be able to serve as a memorial to all those who fell victim and/or responded to the events of September 11, 2001, including all military personnel and the American Public. As I continued to watch videos of The Silent Drill Platoon I was struck by the perfection of execution and the visual impact of the ensemble’s work. From a conductor’s perspective it seemed an insurmountable task to execute such a complex and potentially dangerous drill without verbal or visual cues. Being a student of rehearsals of all kinds, I had to go see them with my own eyes. 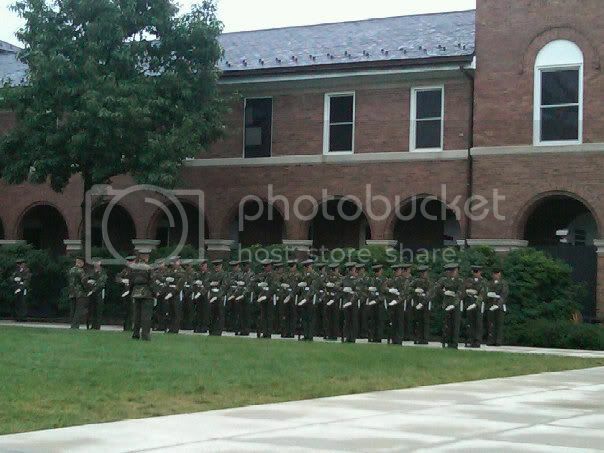 Through a series of phone calls I landed an invitation to attend several rehearsals of military performing groups, including the morning rehearsal for “The Evening Parade” performance at Marine Barracks Washington, DC on Friday, August 13, 2010. On the video tab of this website one can see the video I shot during this rehearsal. My metronome was in my left hand, my camera in my right as I sought to observe with my own eyes rather than through the camera screen. The Marines stepped off, upon a non-verbal cue, at 58 beats per minute (bpm) and did not falter or deviate for nine minutes worth of their routine. 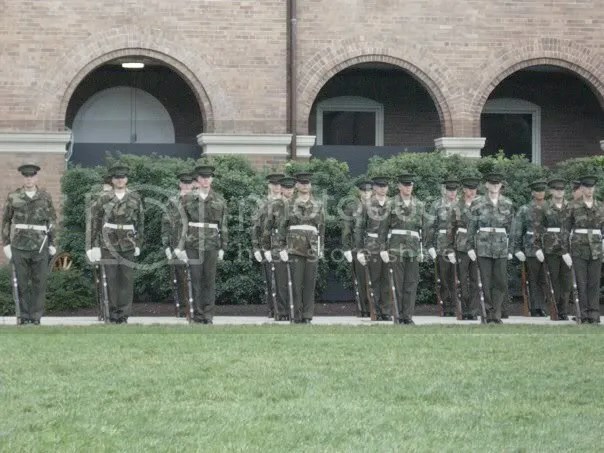 I learned that, like any other performing ensemble, The Silent Drill Platoon sometimes marches slightly faster, as is sometimes dictated by either the adrenalin factor surrounding a particular performance, or at times by design, considering time constraints. The minimal amount of discussion that followed revealed to me that the ensemble does in fact train with verbal responses and counting, which they internalize and later rely upon silently. The cadence to which the one Marine referred is the percussive sounds made by manipulating their rifles and slapping their white leather gloves on their legs. Little sound is generated by their strides, as often they are marching on a grassy area. As the discussion continued, one facet of my mind was calculating how to build this piece: how many movements…how to cue in and out…what do they do when they’re finished? And how perfect, I thought, that amidst the chaos of a nation’s grief and anger, followed by an ongoing exodus of troops to our Forward Operating Bases overseas, would this platoon of ceremonial, infantry Marines offer me the inspiration to make such a dramatic statement through incorporating their expertise in utilizing silence as an integral part of my artistic statement. For silenceis indeed the single-most dramatic effect in music. I can still feel that resonating in my gut. That was my mandate to write this piece, whether or not it is financially possible to premiere on or about September 11, 2011. I went back to the hotel and sketched out the five-movement structure for Stand. 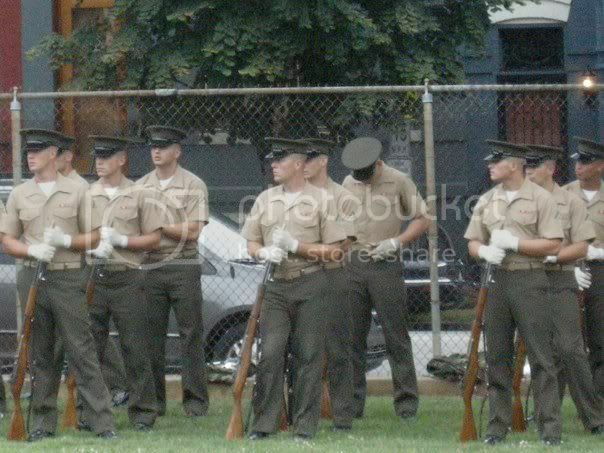 I am forever grateful to those Marines who entertained my whims on August 13, 2010 at Marine Barracks, Washington, DC. Without them, this piece would not exist. Thank you for visiting. Please stop by often and check the blog for updates and thoughts as I write.